Our annual round-up of the future’s best music is filled with enough information to make your head explode, so take some 15-minute breaks, say, every six pages or so. Turn off your cell phone or SideKick; fire up your iPod, sit back and catch up on what MOTION CITY SOUNDTRACK, AGAINST ME!, FALL OUT BOY, THRICE, AIDEN, CHIODOS, AS I LAY DYING, EMERY, COHEED AND CAMBRIA and many more of your preferred rockers are up to. Plus, check out all the excuses from the bands who didn’t put out this year! 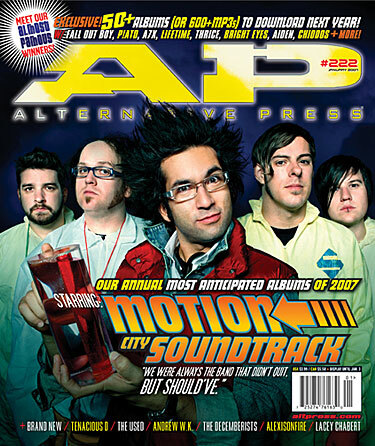 Boston punk forefather MIKE McCOLGAN of STREET DOGS explains how liberalism equals patriotism in OP-ED; and everyone from COBRA STARSHIP to hellogoodbye reflect on 2006 in music in THE AP POLL. We preview albums from Clinic, Of Montreal and more; In The Studio spies on The Academy Is…, Shadows Fall and the Used. 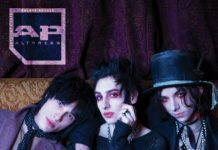 Our AP:DIY section is an exclusive guide for budding musicians, complete with even more exclusive pointers from rockers who’ve been around the block. This month, we get up close and personal with Andrew W.K., as well as members of Halifax, A Static Lullaby, Alexisonfire, Kill Hannah and Say Anything, as well as the techs, personal trainers and other experts who keep ’em in shape, musically and otherwise. Elsewhere, we give the monthly Lowdown on Mute Math, As Tall As Lions, Agent Sparks and others; AP&R introduces you to our Almost Famous contest winners; Chalkboard Confessional talks inspiration with the Decemberists frontman Colin Meloy; Trustkill Records gets the Label Profile treatment; Disclothesure heads to ASR in San Diego to uncover the brands you really need to know; and Fuse VJ Steven lists his favorite holiday tunes in his Untitled Rock Column. Lacey Chabert is dreaming of a Black Christmas; Brian Presley settles into Home Of The Brave; plus, Eye Candy debuts our newest column featuring the sparkling cinematic wit of Every Time I Die frontman Keith Buckley; and Now Showing checks out what’s new in theaters and DVD players this month. The AP Record Store crams in all the end-of-2006 (and a couple 2007) albums it can hold from Brand New, Tim Barry, (+44), The Evens, Kylesa, …And You Will Know Us By The Trail Of Dead, Triumph Of Lethargy Skinned Alive To Death, Stole Your Woman, Pinebender, Imperial, The Dear Hunter and more; we’ve also scheduled some killer In-Studio Sessions with Incubus and Tenacious D; Meat Loaf and Captain Beefheart get respectively waylaid and worshiped in our classic-rock and classic-punk columns; plus, scope out Collector’s Corner and Listening Station for the best of old and new. Will sing for Ts: The prolific songwriter shells for one of our favorite T-shirt companies, pairing hip duds with hot ditties. We listened to over 100 jingles (all in the name of research) to bring you the very best.